Last year was an unsettling year for Pakistanis. With political upheaval and security threats looming, 2012 will likely bring more of the same. Deadly violence bookended Pakistan’s 2011. The year began with the assassination of Salmaan Taseer, governor of the country’s largest province, by his bodyguard. 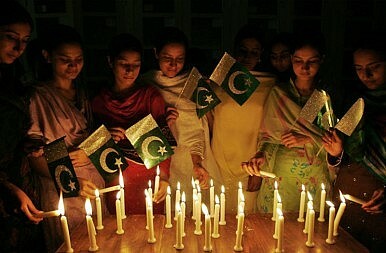 It ended with a deadly NATO attack on a border base that killed 24 Pakistani security personnel. In the months in between, U.S.-Pakistan relations went into free fall. CIA contractor Raymond was acquitted of murder after apparently killing two Pakistanis in broad daylight in Lahore. Later, the United States unilaterally killed Osama bin Laden near a Pakistani military academy, humiliating Pakistan’s army and air force. Subsequently, an angered U.S. Congress moved to restrict aid to Pakistan. Domestically, former cricketer Imran Khan shook up Pakistani politics, with his party emerging as a third way political force. Meanwhile, the ruling Pakistan Peoples Party (PPP) was put on the defensive when an anti-military memo delivered to the Pentagon, alleged to have been coauthored by Islamabad’s ambassador in Washington, forced the diplomat’s resignation and strained ties with the military, sparking talk of a possible coup. Amid all this turmoil, Pakistan’s state and citizens went unattended. Economic growth was anemic, inflation remained high, and major state-owned companies bled billions of dollars. All of this means that 2012 may well be both a year of change, and more of the same. A new government in Islamabad. National and provincial assembly polls are scheduled for 2013, but Pakistanis will likely head to the polls around the time Americans do this autumn. For months, the opposition Pakistan Muslim League – Nawaz (PML-N) has been clamoring for early elections. Now, the governing coalition leader the PPP appears to have decided to move for early polls, currently expected to be held in October. Both the PML-N and PPP face a serious challenge from Khan's Pakistan Tehreek-e Insaf (PTI), which could be the next coalition government’s kingmaker by gaining the third largest share of National Assembly seats. By the year’s end, there could be a new prime minister in Islamabad and a new president-elect in Washington, adding even more uncertainty to the volatile bilateral relationship. Pakistan – Evolution or Revolution? Pakistan: Nawaz Sharif in the Eye of the StormIndia-Pakistan Relations: A Destructive EquilibriumConsidering Kashmir: A Radical Possibility Afghanistan-Pakistan Border: Back to Politics as Usual?